About 2 years ago I was trying to find a copy of the Smallest Dragonboy for my daughter to read, but could not readily find one. I eventually found it in a book called "Beyond the Stars: Tales of Adventures in Time and Space", a book for kids published in 1983. This included stories by George Lucas, Jules Vern, Robert Heinlein and Arthur C. Clark. It is a UK copy I purchased from someone in Australia. I also just purchased, from eBay, a copy of BEST MILITARY SCIENCE FICTION OF THE 20TH CENTURY (2001). I would never have thought to look there for a Dragonrider story. So, what are the most unusual books that you have found one of her stories? Hmmm, I'd have to say that the most unusual thing I've found by Anne is the introduction she wrote to a recent publication of Peter Pan. It's got an interesting bit of info in it that I've not seen in any other publication. Not sure if that quite counts, since it's not actually a story, but I was very surprised to fine Anne associated with Peter Pan. 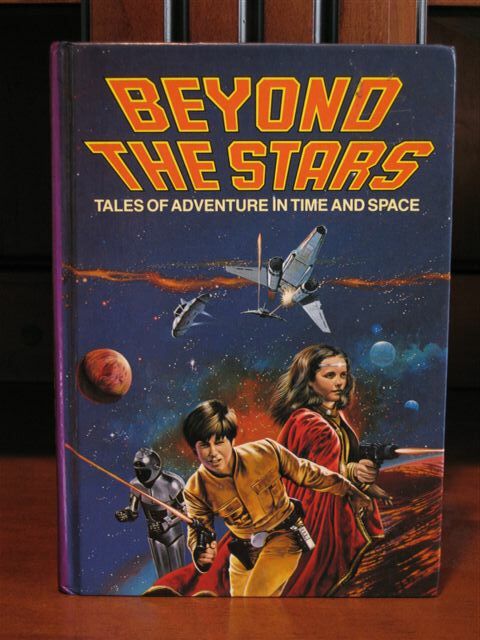 Larry - did you also know that there are several different publications of Beyond the Stars? There are two different covers for it too. Anne is in great company in that book! I did not know there were other versions of Beyond the Stars - this is the only version I have ever come across. But I figured if anyone would know, it would be someone from this forum! I know we had a thread in which we discussed the differences between these books, the Cathay, Octopus and St. Michael editions etc. if I remember correctly and why they existed (but can't find it now). I have two of them and the two different covers. Most of those are foreign language though. I got the Peter Pan about a year ago. P'ter - I think it was after I mentioned it in this forum. I love her intro! Becky: I think your thread on it was before I joined. I remember asking about it AFTER I bought it and found (of course) that you long timers knew all about it. P'ter - my memory it not the greatest. I remember you posting something about it after I mentioned it. And didn't search to see if I could find the thread. I'll never forget the thrill I got the first time I spotted "The Smallest Dragonboy" in my 7th-grade reading book! I was still pretty new to Pern at the time! I'll never forget the thrill I got the first time I spotted "The Smallest Dragonboy" in my 7th-grade reading book! I think I might have used the same book in my 7th grade class. I remember discovering that story in the book, and reading it the moment I found it. I had never heard of that short story until I found it in that textbook. I think I had gotten through all the published Pern books at that point in time, and that would have been through Masterharper. 7th grade for me would have been from 1999 to 2000. I remember reading Katherine Kurtz's books in 7th grade, and some other things more than reading anything by Anne McCaffrey. Mine's in a little green booklet though (which i got signed in Copenhagen), and I'm guessing it was pulled from the book, since it was abridged. Which Peter Pan book? My brain's fuzzy, I haven't heard of this one! I have that one....It tickled me that she would add something to that book...I have always loved the story...and now even more!!! I have a different copy then to that one, Hans. O well, I'll have to look for it now. Not sure if this qualifies as unusual, but I was looking around too for those short stories that some of Anne's later novels were based on and I found this one: Get off the Unicorn. (Photo also below). Three stories are included which are some that the Talent books were made from: "Lady in the Tower" (1959 - Anne's First published story), "A Meeting of Minds" (1969), and "Apple" (1969). T2KincaidDano - I've not seen that cover of GOTU, but the book itself isn't unusual. That and The Girl who Heard Dragons are the two major collections of Anne's shorts. That is the common US paperback cover for Get off the Unicorn. I remember my second year of teaching, thumbing through one of the Language Arts text books for my Grade 7 and 8 class and discovering "The Smallest Dragonboy". I couldn't believe that I was able to share a story by my most favourite auther with my students. It was awesome. Mine wasn't AMC but a Star Trek: Teleplay 'Troubble with Tribbles' who has an connect with Anne but that is as far as I'm going.